Single ticket includes two (2) drink tickets. Couples Ticket for 2 includes two (2) drink tickets per guest. Sponsor a ticket for a teacher or staff member! Table for 10 includes two (2) complimentary bottle of wine for the table and two (2) drink tickets per guest. Select an amount below or offer an auction item. I have read and agree to the Terms and Conditions and give my consent to Villa Montessori School to process my personal data. I understand I can revoke this consent at any time. Villa Montessori's annual Auction is on Saturday, April 27th, starting with a silent auction cocktail hour at 6:00 pm and followed by dinner and a live auction at 7:30 pm. This annual event is a critical component of the school's operating budget, proceeds directly fund our indispensable teacher assistants and classroom needs. Our community's dedication to the children of Villa is truly exceptional and every child directly benefits from your generosity. We hope you will consider supporting local education by attending this incredible event or by making a tax-deductible donation of a product, service, or cash to this year's event. Thank you for your continued support. We hope to see you there! Join your friends at Casablanca Rooftop Lounge to continue the party after the auction. This portion of the event is not hosted by Villa. Hotel Valley Ho is a hip, vibrant and bold boutique hotel located in historic Old Town Scottsdale. This locally owned hideaway combines the best of contemporary modernism with classic mid-century design details. Mention "Villa of the Future" to receive a discount on your room. Thank a Villa teacher, teacher's assistant, or staff with a ticket to this year's auction! Purchase the ticket and indicate the name in the appropriate field. Email loconnell@villamontessori.com with any questions. Interested in being on the 2020 Committee? 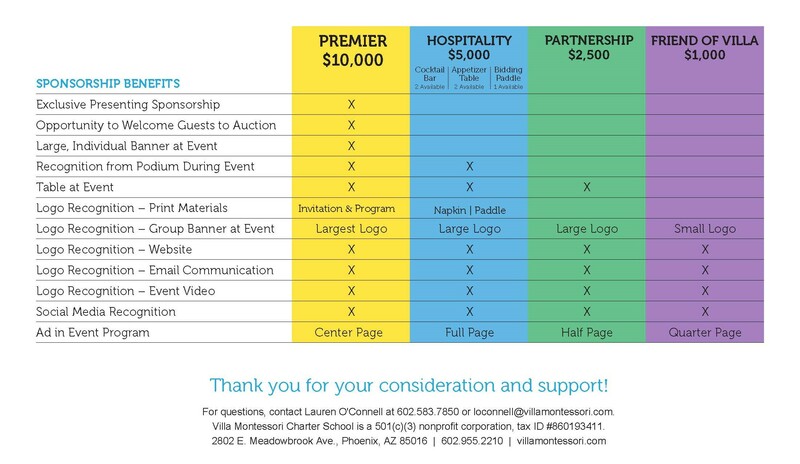 Email Lauren O'Connell, loconnell@villamontessori.com, to learn more! Email loconnell@villamontessori.com for more information.